Situated all the way up on the 28th floor, Ambrosia offers a stunning cityscape view as a backdrop to its delicious seafood menu. Freshly-shucked Oysters are the main draw and the restaurant’s selection changes according to the seasons. Ambrosia’s happy hour menu is one of the best seafood deals in town. Available on weeknights from 5pm-7pm, this reservations-only menu features a six-piece oyster platter with a glass of white wine or champagne for as low as $188 per person. Shop 2802, 28/F, iSquare, 63 Nathan Rd, Tsim Sha Tsui, 2368 6901. $1,000. This much-loved seafood joint serves British classics in elegant yet laidback surrounds. Aside from smoked fish and hearty pies, look out for the impressive selection of jet-fresh oysters served over ice. Come during “Oyster Wednesdays” when a single variety of oyster goes for $10 a pop from 6pm onwards. It’s also worth noting that DotCod are pioneers in the sustainable seafood movement so you can feast away happily for a green cause. B4, Prince’s Bldg, 10 Chater Rd, Central, 2810 6988. $600. Formerly named Mi Casa, this oyster joint is a cult favourite with the hip Tai Hang crowd. Diners can mix and match their own oyster platter or have the restaurant’s friendly team put together the freshest selection on ice. Seafood aside, desserts are another must-try, especially the baked Alaska and sweet chocolate fondant. 7 King St, Tai Hang, 2808 1248. $600. Tucked away behind a nondescript commercial building in Tsim Sha Tsui East, Open Oyster is truly one of the best kept secrets in town. A smattering of alfresco seating out front and the shelves of wine bottles near the back give off a charming European vibe. Baskets of fresh oysters sit prettily over ice in the small display windows for diners to ogle. The fresh oysters go for a fraction of the price at hotel-level restaurants and there’s also a discounted price if you order your oysters with wine. Shop 56, G/F, Southseas Centre, 75 Mody Rd, Tsim Sha Tsui, 2366 3808. $500. This old-school restaurant at The Sheraton is widely regarded as being one of the best spots in the city for fresh oysters. The raw seafood bar stocks more than 20 varieties of oysters on the half shell every evening, with seasonal choices flown in from all over the globe. The restaurant’s Sunday brunch deal is especially popular. 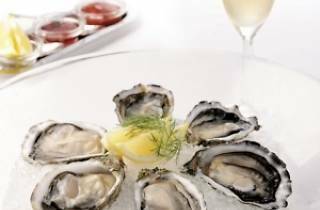 $638 gets you a sumptuous seafood buffet, with a selection of freshly-shucked mollusks while $688 includes free-flow Piper-Heidsieck champagne to wash down the food. 18/F, Sheraton Hong Kong Hotel & Towers, 20 Nathan Rd, Tsim Sha Tsui, 2369 1111. $1,500. This shoebox-sized hut specialises in takeaway orders. But its location on a car-less, quiet stretch of Hung Hom also makes it an ideal spot for dining in, and manager Frankie Yu will happily set up an impromptu alfresco dining environment with a few fold-up tables and chairs. They’ve also taken over a small store with several more seats, just a few doors down from their take-out location. At both branches, a rotating selection of around 20 types of oysters are offered every day, all at a substantially lower price than most western seafood restaurants in town. Shop G2 & K2, 29 Tak Man Street, Hung Hom, 3521 0876. $400. This low-key Happy Valley restaurant is a favourite among many local celebrities living in the area. The maritime-themed décor complements the menu of fresh, chilled and cooked seafood. As the name suggests, oysters are the main attraction and the restaurant stocks around 20 different types daily, ranging from mild and crisp, to briny and creamy. 14 Min Fat St, Happy Valley, 2572 2028. $800. This was once John “the oyster king” Stewart’s turf until he moved onto other oyster-shucking pastures (first Bentley’s, then The Codfather, see below) when the restaurant closed down its original location on Aberdeen Street last summer. The Oysterman has since relocated to a new spot on Wellington, doling out the same fresh, briny bivalves at reasonable prices. 13/F, 33 Wellington St, Central, 2815 2208. $600. Housed on a quiet street in Sheung Wan, this tiny restaurant turns out some of the freshest seafood in the neighbourhood. The restaurant sources their oysters from different waters around the world, including Willapa Bay in America, and the waters of South Pacific Australia. Seafood lovers should go for the giant seafood platter for two, which includes sea whelks, sweet prawns, scallops, clams, and an assortment of freshly-shucked oysters. 31 Bridges St, Sheung Wan, 2549 0132. $600. This cheekily-named seafood joint hosts resident oyster specialist John Stewart and peddles the freshest catch from the sea. The giant seafood platter serves up chilled things on the half-shell, as well as cooked crabs, prawns, and the likes. The blackboard menu chalks the daily crop of super fresh oysters. 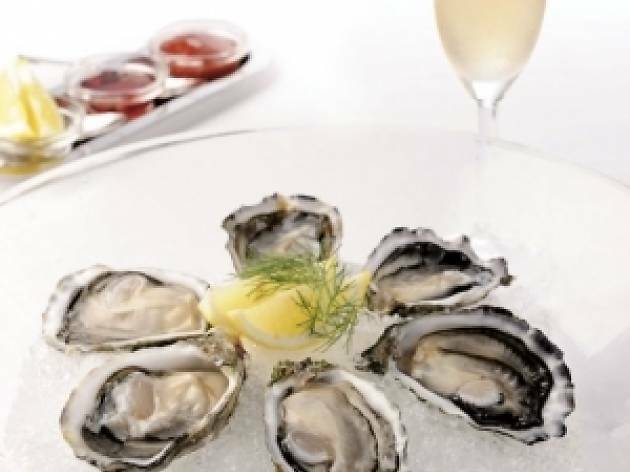 There’s also a great selection of oyster and wine deals, starting from just $99 for three oysters and a glass of house wine. 23 Hoi Wan St, Quarry Bay, 2856 5000. $400.